Home Community What do you know about tapeworms and head lice? What do you know about tapeworms and head lice? What do you know about parasites? Halton Borough Council has teamed up with Daresbury Laboratory to co-host a lecture from the popular Talking Science series at Halton Stadium. The series of talks covers stimulating science, maths and the universe topics and is aimed at families and the general public. 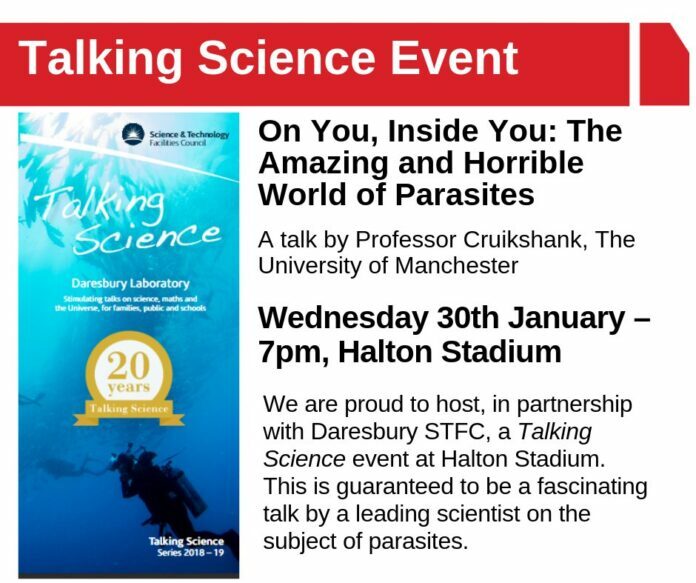 The event at Halton Stadium will cover the amazing and horrible world of parasites, the most common form of cellular life on our planet. Professor Sheena Cruikshank from The University of Manchester will talk about the amazing versatility of these organisms that live in us and on us. This talk is aimed at all science lovers and is suitable for ages 6+. The Amazing and Horrible World of Parasites talk is on Wednesday 30 January, 7pm at Halton Stadium. Free tickets can be booked via www.halton.gov.uk/libraries or at any Halton Library. The full series of Talking Science events run by Daresbury Laboratory can also be found via the library website. Is Pete Waterman coming to the Brindley Theatre? There is going to be a murder in Runcorn. Want to help solve it?